The Imperial forces from Star Wars sure do know how to have fun when they’re off-screen not fighting the rebels. 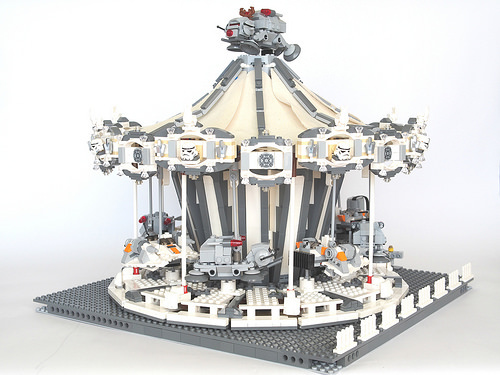 At least that’s what Star Wars fan Handoko Setyawan imagined by taking the design of 10196 LEGO Creator Carousel, recoloring it, making a few mods, and throwing in some Micro Fighters to create what he calls the Imperial Carousel. 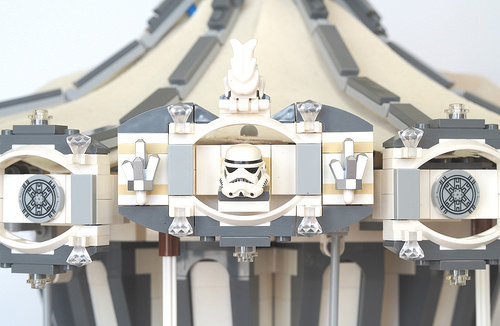 According to Handoko, the original design of LEGO’s carousel had to be structurally enhanced to accommodate the heavier Micro Fighter vehicles, which also required some tweaking. I love the various replacement motifs (such as the Storm Trooper helmets) as well as the muted Imperial grey theme. Thanks for pointing it out! I did have a word with the builder featured, and apparently Nick’s build wasn’t known during his own inspiration to build. Star Wars has a huge base, 40 years of history and millions (and millions) of fans, so does LEGO, so it’s not far fetched that two huge fans of both had the same inspiration. And looking at many builds that we feature, there are many similar inspirations for various creations along the way! And I did find out both Nick and the builder already had a chat and both acknowledged and realised neither of them was the first and there’s a 3rd SW Carousel out there that was done way before either of them ever knew. So, looks like it’s 3 SW Carousel yet no one knew each other was working on it! It looks like The Force is strong in the LEGO community!!! Happy 40th Anniversary Star Wars everyone!